Cloudsdale seemed to have a normal day. The wonder lots were training. The weather was scheduled to stay sunny and there weren't any huge plans being made. It was a calm happy day in cloudsdale. Suddenly an intimidating gunmetal grey chariot led by two rather frightening looking Stallions in matching grey armor landed upon a cloud at the entrance of the beloved city of clouds. 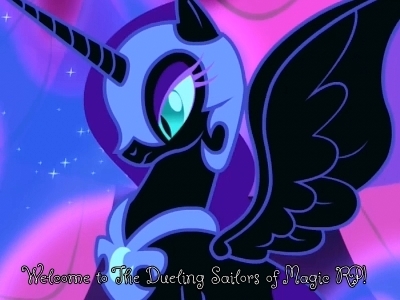 A dark maned Alicorn stepped off of the chariot. " Come you Foals. Don't just stand there!" He ordered as his guards unchained themselfs from the chariot. This wasn't normal, a strange pony: an Alicorn that no one had ever seen, had just entered cloudsdale as if they owned the place. His cutie mark was disturbing: a SKULL wearing a crown. His piercing blue eyes looked over every pony in cloudsdale. Why was he there, what did he want? Bangle Flap had been having a normal day in Cloudsdale. Keywords apparently being "had been," as she noticed the strange chariot and even stranger alicorn that had just arrived. Judging by the crowd, he wasn't expected, and as Bangle flew over to see him, she considered who this could be - the only alicorns she knew were the Princesses, and this was a stallion. She flew up to get over some of the crowd and gasped as she saw his cutie mark - a skull on the flank of an alicorn? What kind of powers could he have? The grey Stallion began looking over the different pegasus. Checking their wings, body structure. He didn't care if anypony whined. " Foals! Show royalty respect!" One of te armor clad guards shouted, right in bangle flap's face. " Bow down before his Highness Prince Iron Hoof!" The other guard glared. Bangle flew backwards quickly in shock. How... brazen of this mysterious Prince! Newly afraid, she flew down to the clouds, winding up at the front of the group. As fast as she could, she bowed as she would to one of the Princesses. "Ugh..." Bangle murmured quietly, her ears ringing. All this close shouting was starting to hurt! "My name's Bangle Flap, Prince," she answered, her voice tinged with fear. She'd heard the other guard over the ringing - clip her wings? That was one of the worst things one could do to a pegasus! Who was this alicorn?!
" What is your wingspeed?" The Prince asked. His voice was cold and distant and his midnight blue eyes were piercing and cruel. The guards began to tell at other ponies, asking similar questions. "9.0, last time it was measured," Bangle answered. She knew it was a little bit below average, but since she spent most of her time flying slowly, she figured she might have done that to herself. The last time she'd really tried to fly fast was when Rainbow Dash had led her in bringing water to Cloudsdale. ... Why are you asking this? she asked the alicorn mentally. The Alicorn looked disgusted " That is a terrible wingspeed. I suppose I could fix that." He said "Celestia's subjects are so weak it infuriates me. How does she expect to get anywhere without an army. She just has her guard and the elements of stupidity." "H-Hey!" Bangle said, jumping up. "That's Princess Celestia you're talking about! Don't insult her! And don't insult the Elements of Harmony either, you-you brazen intruder!" She realized this was probably incredibly stupid, but she couldn't let an insult to one of her Princesses just go by. At that moment, she didn't care who this pony was - she just wanted to set him straight!
" Brazen intruder?" He laughed, it was dark, demented. His horn glow led a dark red and Bangle was picked up by her tail. " How about I throw you half way across Equestria? Or worse, feed you to the manticore and timberwolves in the Everfree Forest." Bangle yelped when she was yanked upwards, out of her control. "I-I'm not afraid! I can make it just fine in the Everfree! B-Besides, I have a friend there!" she said, trying to conceal the growing terror in her voice. She didn't really know anything about the zebra in the woods, other than the fact she was there, but she desperately tried not to lose her nerve now. "A-And anywhere else in Equestria you could toss me would help me get home! Because Equestrians don't just start threatening ponies for no reason!" "You-You wouldn't do that!" Bangle protested, trying to flap her way out of the magic field. "Word is already getting to the Princesses about your arrival, I'm sure! If they found out you did something like that, I don't think they'd let it go very easily. They might send the Elements on you, and even being an alicorn couldn't save you from them!" Subject: Re: Royalty in Cloudsdale: A New Darkness Appears.